At Fortes Medical your hair is our Forte. With a vast expertise across a range of surgical and non-surgical hair loss treatments, we strive for excellence in delivering the optimum hair restoration solution to every patient that walks through our doors. We are continuously up to date with the latest developments and techniques, always looking to be at the cutting edge of hair restoration. 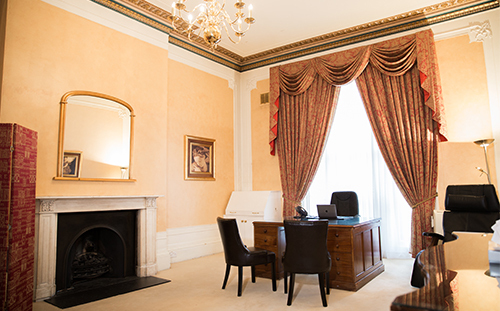 Holding a prime spot on the world-renowned Harley Street, London – the heart of the British medical world, Fortes Medical is located close to several tube stations and is easily accessible for those living both inside and outside of London. With an informative and supportive approach, our clients can make confident decisions on how they wish to achieve they are desired natural looking hair. We intend to make your experience as comfortable as possible and to ensure that the highest standards of care are met, we are registered with and inspected by the Care Quality Commission (CQC), the Government healthcare regulator. Dr Saaed sees Hair Restoration as an art where he passionately exercises his flair and skill in bringing his clients the hairline they want to create or bring back what they once had. When drawing out the hairline design Dr Saaed recognises that each patient is unique and takes all the time needed to fully understand a patient’s expectations and goals. His training and attention to detail means that he is consistently achieving the best results. Combining both surgical and non-surgical approaches Dr Saaed provides the most effective and pleasing aesthetic result for his patients currently available. His love for the field of hair restoration stems from the immensely satisfying life changing impact he has on patients lives, by being able to help patients regain their confidence and self-esteem when restoring their hair. The difference he makes to men and women suffering from hair loss is both personally and professionally rewarding. Dr Saaed graduated from Medical school with a degree in Medicine and Surgery (MBChB) in 1997, later specialising as an Anaesthetist. He completed his training in Hair Restoration under some of the most renowned hair transplant surgeons in the USA, UK, Turkey & Georgia. Now an associate member of the International Society of Hair Restoration , Dr Saaed ensures that he is fully up-to-date with all the latest techniques by regularly attending conferences worldwide. He has been expertly trained to perform SMP with Finishing Touches and specialises in combining Hair Transplants with SMP to create a denser hair appearance, achieving the best look for the client. Dr Saaed has qualified in PRP Treatment with Dr Danial Sister a renowned specialist in PRP and an author of the book “Platelet Rich Plasma, The New Frontier in Regenerative and Aesthetic Medicine”.